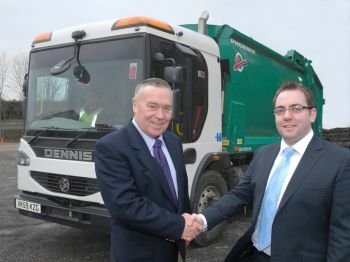 Monmouthshire County Council’s new Dennis Eagle Refuse Collection and Recycling Vehicles (RCV’s) have been fitted with the most superior mobile safety technology, thanks to vehicle safety equipment specialists, Innovative Safety Systems (ISS) Ltd, based in Lutterworth, Leicestershire. Each vehicle is fitted with a mobile Digital Video Recording system (DVR), complete with CCTV cameras and colour monitors to assist the vehicle operator during reversing manoeuvres and to record any incidents. For the first time in Monmouthshire, safety reversing radars have also been fitted to inform the driver of any obstructions with the ultimate aim of eliminating all reversing incidents. ISS have also provided ancillary products, such as jet-washes to clean the camera lenses to ensure good picture clarity. The ISS team has over 30 years combined experience in the waste, recycling and CCTV sectors, and provides vehicle safety products to a wide range of sectors, from waste management, to the emergency services, haulage, mobile plant and passenger transport sectors. Their extensive range of products includes mobile DVR systems, reversing camera systems and reversing radar. They also provide a nationwide maintenance and repair service, for all vehicle safety equipment, with a two-hour call out option. Gavin Thoday, Director, ISS said: “We are delighted that Monmouthshire is taking its vehicle safety seriously and we are sure that they will reap the benefits. Our products our engineered to the very highest specifications so operationally they are robust, as well as easy to use. We install the equipment so that it integrates seamlessly with the daily operations of a refuse vehicle and can withstand the rigours of that environment.